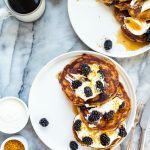 These blackberry buckwheat pancakes have four flours, giving them a complex depth and rich flavor. They have frozen blackberries, making them easy to enjoy all year round! In a mixing bowl, whisk together the flours, sugar, baking powder, baking soda, and salt. Set aside. In a separate bowl, whisk together the buttermilk, eggs, melted butter, and vanilla. Combine the wet and dry ingredients, mixing until almost smooth (but still a little lumpy). Heat a skillet or griddle on medium-high heat. Melt a tiny bit of butter, then pour 1/3 cup of batter onto the hot griddle. Immediately scatter a small handful of berries on top of the uncooked pancake. When the edges of the pancake are dry, and bubbles are holding their shape in the middle of the pancake, flip and cook for another minute on the other side. Repeat with all of the batter, and serve warm with maple syrup and other pancake toppings (yogurt, bee pollen, peanut butter, butter, etc. ).